BACKGROUND: Studies from Europe and North America suggest that 20 - 50% of patients with dilated cardiomyopathy (DCM) may have familial disease. There is little information on the frequency and clinical genetics of familial DCM in Africa. PURPOSE: To determine the frequency and probable mode of inheritance of familial DCM in patients referred for investigation of the cause of DCM at a tertiary centre in Cape Town. METHODS: We conducted a retrospective analysis of consecutive patients diagnosed with DCM between 1 February 1996 and 31 December 2009 to determine the frequency of familial disease. RESULTS: Of 109 unrelated patients with DCM, 29 (26.6%) had familial disease. Their mean age of onset of cardiomyopathy (28.01 (standard deviation (SD) 15.33) years) was significantly younger than that for non-familial cases (39.1 (SD 12.6) years) (p=0.001). Male predominance (N=21, 72.4%) and racial distribution (15 (48.3%) coloured patients, 10 (34.5%) black Africans, 4 (13.8%) white individuals, and 1 (3.4%) of Indian descent) of familial DCM probands were similar to the non-familial cases. Of the 29 patients with familial DCM, 2 (7%) had at least one relative diagnosed with peripartum cardiomyopathy. Pedigree analysis of the 29 families was consistent with autosomal dominant inheritance in 72.4%, autosomal recessive inheritance in 17.2% and X-linked recessive inheritance in 10.4%. 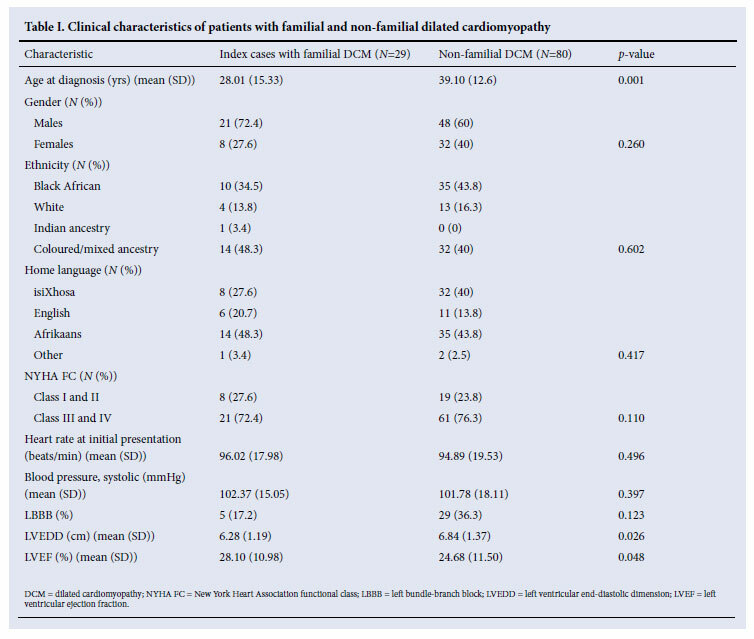 CONCLUSIONS: Familial DCM affects at least a quarter of African patients with DCM, presents at a young age, is associated with peripartum cardiomyopathy, and follows an autosomal dominant pattern of inheritance in the majority of families. Family screening for familial DCM is indicated in all cases of unexplained DCM, including patients with peripartum cardiomyopathy. We know of no information on the frequency and clinical genetics of familial DCM in Africa.12 Our aims were: (i) to describe the frequency of familial DCM in patients who were diagnosed with DCM and followed up in a cardiomyopathy clinic at the Cardiac Clinic, Groote Schuur Hospital (GSH), Cape Town, from 1 February 1996 to 31 December 2009; (ii) to determine, through pedigree analysis, the likely modes of inheritance of familial DCM in this cohort; and (iii) to address the implications of the findings for the clinical evaluation of patients with unexplained DCM. We reviewed the medical records of all patients evaluated for a cause of cardiomyopathy from 1 February 1996 to 31 December 2009. These patients were seen in a dedicated cardiomyopathy clinic, where one of the authors (BMM) has a special interest in disorders of heart muscle, and do not reflect the total experience of the GSH Cardiac Clinic. Patients included were those with DCM, as evidenced by clinical signs and symptoms of heart failure associated with left ventricular dilatation and a left ventricular ejection fraction less than 50% on echocardiography or cardiac catheterisation. Patients with any of the following conditions were excluded: rheumatic or other intrinsic valvular heart disease, coronary artery disease, pericardial disease, chronic hypertension, congenital heart disease, and any other systemic disease with cardiovascular sequelae such as diabetes, drug-induced cardiomyopathy, haemochromatosis, neuromuscular disease, infantile endocardial fibro-elastosis, endomyocardial fibrosis, amyloidosis, or myocarditis documented on endomyocardial biopsy or associated with proven viral infection. Patients who drank alcohol were included, since such persons may have a genetic predisposition to DCM and their exclusion could spuriously inflate the proportion of patients with familial DCM because a diagnosis of alcohol-induced cardiomyopathy might be made more readily in the absence of a family history of DCM. For similar reasons, patients with peripartum cardiomyopathy were included. However, patients with hypertrophic, restrictive and tachycardia-related cardiomyopathies were excluded. A two-to five-generation family pedigree was constructed for every patient with DCM. If a subject with DCM had any firstdegree relative who was also affected with DCM, those firstdegree relatives were invited for screening for DCM by history, physical examination, electrocardiogram (ECG), echocardiography and cardiac catheterisation where indicated. For deceased relatives, medical records were reviewed when available. Relatives with other cardiac disorders that could account for left ventricular dysfunction were excluded. Pedigree analysis was performed for all affected families to ascertain the probable pattern of inheritance of familial DCM. Pedigrees were constructed using the Cyrillic 2.1 software programme (http://www.cyrillicsoftware.com/). Results of quantitative variables are given as mean (standard deviation (SD)). Categorical variables are represented as number and percentage. Pearson's chi-square or Fisher's exact test was used to compare the relative frequency of characteristics between individuals. All p-values are two-sided, and p-values <0.05 are considered to indicate statistical significance. The study was approved by the University of Cape Town Faculty of Health Sciences Human Research Ethics Committee (REC Ref. No. 197/96). Participants gave written informed consent. All eligible patients were asked for permission to invite their first-degree relatives (parents, siblings and children) to participate. Of 109 unrelated cases with DCM studied, 29 (26.6%) had familial DCM. They were derived from all the populations of Cape Town and reflected the referral base of GSH, with 15 (48.3%) coloured/ of mixed ancestry, 10 (34.5%) black African, 4 (13.8%) white, and 1 (3.4%) of Indian descent. 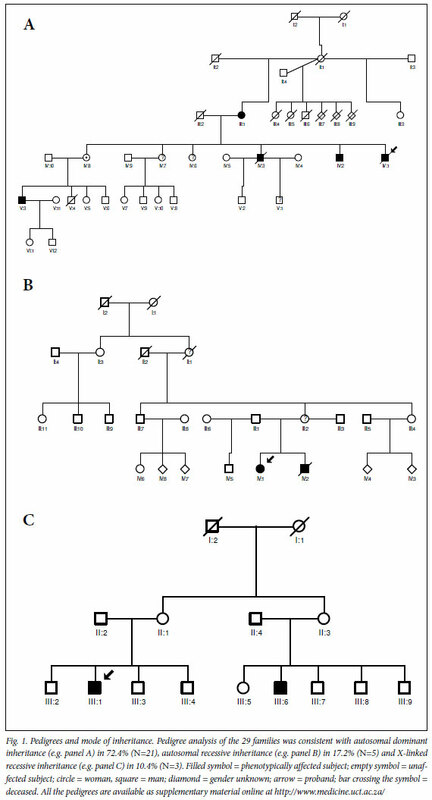 A total of 40 individuals with familial DCM were finally identified through family screening of the 29 original unrelated patients. 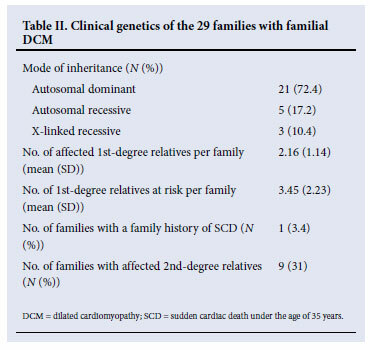 The 29 unrelated cases with familial DCM had a mean age at diagnosis of 28.01 (SD 15.3) years, with a preponderance of males (N=21, 72.4%); their characteristics were comparable to the total of 40 individuals with familial DCM from the 29 families studied (i.e. 72.5% of them were male, with a mean age at the time of diagnosis of familial DCM of 25.58 (SD 15.1) years). The age of the individuals with familial DCM was significantly lower than that of patients with non-familial DCM, who had a mean age of 39.1 (SD 12.6) years at the time of diagnosis (p=0.001) (Table I). There was no difference in degree of effort intolerance measured by New York Heart Association functional class at presentation between the index cases with familial and non-familial DCM (Table I). The patients with familial and non-familial DCM also had similar heart rates and mean systolic blood pressures at presentation (i.e. 95.6 (SD 23.3) v. 94.9 (SD 19.5) beats/min (p=0.496) and 100.1 (SD 14.9) v. 101.8 (SD 18.1) mmHg (p=0.397), respectively). While the frequency of ECG left bundle-branch block was lower in the familial cases (17.2%) compared with the non-familial cases (36.3%), the difference was not statistically significant (p=0.123). However, patients with familial DCM had significantly less ventricular dilation than the nonfamilial cases, the left ventricular end-diastolic dimension (LVEDD) being 6.2 (SD 1.1) cm in the familial group versus 6.8 (SD 1.4) cm in the non-familial group (p=0.001) (Table I). The number of affected first-degree relatives per family was 2.16 (SD 1.14). In these 29 families with DCM, the number of first-degree relatives at risk was 3.45 (SD 2.23) per family. One family (3.4%) had a clear history of a member with sudden cardiac death before the age of 35 years. Of the 29 families included in the analysis, 9 (31.0%) had second-degree relatives who were affected. It is noteworthy that 2 of the 29 unrelated patients (7%) with familial DCM had at least one relative diagnosed with peripartum cardiomyopathy, confirming that some cases of peripartum cardiomyopathy are part of the spectrum of familial DCM. We have shown that familial DCM is common in African patients with unexplained DCM, occurring in a quarter of DCM patients studied. We found that familial DCM has a predilection for males and an early age of onset, with the mean age at diagnosis being 28 years. Over 70% of the affected families demonstrated an AD pattern of inheritance. These findings have major implications for the clinical evaluation of patients with unexplained cardiomyopathy (including those with peripartum cardiomyopathy), in whom family screening of first-degree relatives for cardiomyopathy is indicated. We are grateful to the patients and families who participated in this study. We also acknowledge the expert assistance of Ms Lebogang Montewa, Ms Stella du Toit, Mr Simpiwe Nkepu, Ms Carolina Lemmer, and Sisters Maitele Tshifularo, Unita September and Veronica Francis in the execution of this study. The authors are funded in part by research grants from the University of Cape Town, the Medical Research Council of South Africa, the Discovery Foundation, the National Research Foundation of South Africa, and the Lily & Ernst Hausmann Research Trust.